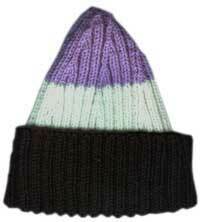 This is a snug fitting hat that stretches to suit the wearer. Sized for an adult man. Approximately 22sts and 30 rows to 10 cm (4 inches) over plain st st on 4mm needles. Cast on 126 sts and work 6 inches K2, P2 rib. *Change to your second colour and work 2 rows rib. Place a marker after every 21st st (eg, after the 21st stitch, the 42nd st, the 63rd stitch, and so on). Repeat from * four times more, making sure to keep your decreases on the same side of the markers as before. Ie, when you’re working your decreases on a WS row, work as follows: P2tog, rib to the next marker, repeat across row. Repeat the last 2 rows 7 times more (48sts), then decrease every row until 6sts remain. Break yarn, thread through sts, pull tight and secure. Sew all ends in neatly, making sure that all darning on the first 3 1/2 inches of the hat is done on the RS of the knitting so it doesn’t show when the brim is turned up. Mark 3 1/2 inches from the beginning of the knitting and sew the seam neatly from this point, to the top of the hat. Sew the remainder of the seam with the neat side on the outside of the hat. Fold brim up for 3 inches as shown in the picture. This pattern and images are Copyright © Sarah Bradberry August 1999, all rights reserved.